CASTLES RESIDENTIAL SALES & LETTINGS NAMED BEST AGENT IN THE WEST REGION BY RELOCATION AGENT NETWORK! Local estate agent, Castles Residential Sales & Lettings is proud to announce that they have won Relocation Agent Network's prestigious 2018 Best Agent West Regional Award. The win was announced at a recent Awards Dinner, which followed the Network's National Conference and Exhibition. The annual prize gives the winning Network member the title of ‘Best Agent in the West Region' and is awarded on a number of strict criteria including customer satisfaction, business innovation and a proven record of helping relocating buyers move in and out of the local area. 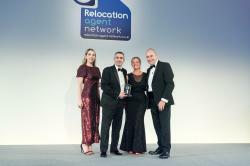 Mark Noble, founder and managing director of Castles said of their win, "We are thrilled to be named as the region's best Relocation Agent Network agent. Not only does it demonstrate to our customers that we are one of the area's leading estate agents, but it rewards all of the Castles team for their outstanding commitment to quality service over the last 12 months." Richard Tucker, Relocation Agent Network's Managing Director said, "This Relocation Agent Network accolade demonstrates Castles ability to deliver business innovation, whilst maintaining the highest standard of service. Congratulations to all the team at Castles for a thoroughly well-deserved win."